Here’s another article on family history. I’m not sure why that particular topic has been at the forefront for the last two articles, nonetheless, here it is. Dad was born on July 9, 1927, thus he did not turn 18 until after VE day, May 8th, 1945. Shortly afterward, he was inducted (drafted) into service. His Selective Service record is below. The picture shows his army jacket. From the size of it, I’d say Dad was no more than 130 pounds at the time. The blue cloverleaf is the insignia of the 88th Infantry division, commonly referred to as the Blue Devils, as is shown on the rocker, above the insignia. 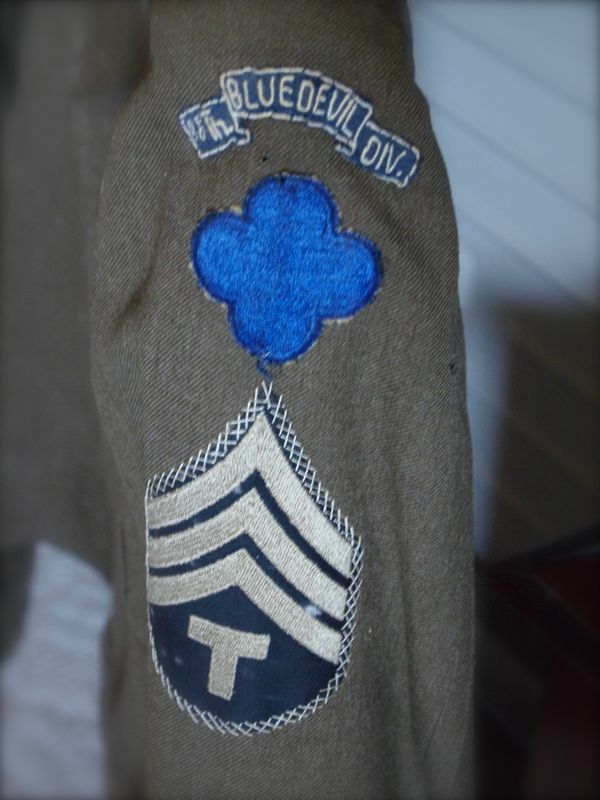 His rank at completion of service was Technician 4th Grade, which was indicated by three stripes in the chevron, with a T underneath, as seen on his jacket. This was equivalent in rank to a Sergeant (sometimes called a Buck Sergeant), but were issued to denote a specialization of skill, and generally provided higher pay. In Dad’s case, I remember from discussion with him one time that he served as a payroll specialist, in the occupational forces in Italy. Among other duties, the 88th managed the repatriation of approximately 325,000 German PWs (Prisoners of War – this was the abbreviation of the time, according to Dad. It changed at some later time to POW). In a discussion I initiated in the mid-Nineties, Dad told me of one particular German, Fritz, who was a tank commander prior to capture. Before his repatriation, he worked in Dad’s payroll group, and was well liked by the Americans with whom he worked. Dad said that Fritz mostly just wanted to go home, and be with his family. Although I do not know his exact discharge date, his service was for a 2 year period, and the 88th went inactive on September 15, 1947. Growing up, we all used to sing a song to tease him. The story goes as we were told, that while on ski patrol, he broke his leg. I have no way of being able to verify this, now, but we got great enjoyment at his expense out of singing our little song about his accident. The only other memory I know of with regard to his service was another he shared with me in that same conversation back in Salina. Dad had been raised in Kansas, and his basic training had taken place at Fort Leonard Wood, in Missouri, so he had seen very little of the world. Troops were transported to Europe in those days on converted ocean liners, so he and aproximately 2000 other soldiers set sail for Italy. He said that while the ocean voyage was monotonous, their arrival to the Mediterranean Sea took them through the Strait of Gibralter. Dad said that the view of the Rock of Gibralter was to him, a young 18 year old man from Kansas, an amazing site. Given that he could recall it so clearly, 50 years later, it must have been. Source: Adjutant General Armed Forces Personnel Who Served between September 16, 1940, and June 30, 1946. It would be great if you could document more of our genealogy. I find it fascinating. Actually, I’m slowly but surely working on it. My next step will be to scan and post the minutes from the Peterson family reunions. How to make a Laylacat!